As a young man, director Masaki Kobayashi underwent a series of life upheavals as soon as 1941, when he graduated from studying Asian art at Waseda University in Tokyo. Knowing that the escalating Pacific War made his future uncertain and guessing how long it would take to establish himself in the academic world, he turned his attention to the film industry. He joined the apprentice ranks at Shochiku studios and was subsequently drafted only eight months later, in early 1942. His experiences in the Japanese military, and the ramifications of its inhumane treatment of conquered civilians, as well as its own soldiers, plus the rampant nationalism exemplified by many citizens in then current Japanese society (and its obvious obsession with continuing feudal samurai traditions), radicalized his perceptions about moral fortitude in the face of overwhelming odds. Though viewed as an exemplary soldier, he repeatedly refused promotion to any rank higher than a private for the duration of hostilities. In 1944 he was captured and spent a year in a POW camp. He did not return to Shochiku studios until 1946 and almost immediately was assigned to work as an assistant director to pantheon filmmaker Keisuke Kinoshita, an expert at turning out superb dramas, romances and comedies about family life. Kobayashi was not especially enamored of the subject matter but came to love and respect Kinoshita as a teacher and artist. Once Kobayashi was granted permission to direct his first film, he was handed similar material by Shochiku’s head, Shiro Kido. It wasn’t until his third picture, The Thick-Walled Room, that Kobayashi was able to explore the themes of social injustice and individual responsibility he would pursue off-and-on for the remainder of his career. However, the nature of the subject matter – the savage scapegoating of lower echelon war criminals following orders while their superiors who had instituted the bestial policies were set free or, at the very least, held immune to full-blown prosecution – proved too controversial for studio head Kido who wanted to edit the film to soften its criticism of complicit Japanese authorities and American Occupation forces. Even though the Occupation had ended, Kido was fearful of repercussions from American officials down the line. Kobayashi refused to cut the film. Consequently, it was shelved until 1956. Shochiku president Kido was not happy about Kobayashi’s seemingly intransigent behavior but regarded him as uniquely talented and did not want to lose him. As a result, Kobayashi was given more material typical of his mentor director Kinoshita with titles like Three Loves (1954), Somewhere Under the Broad Sky (1954), Beautiful Days (1955) and The Spring (1956) before getting to make another hard-hitting social drama. I’ll Buy You from 1956 was based on a popular novel and is a ferocious exposé of the corrupt bidding wars in Japanese professional baseball. 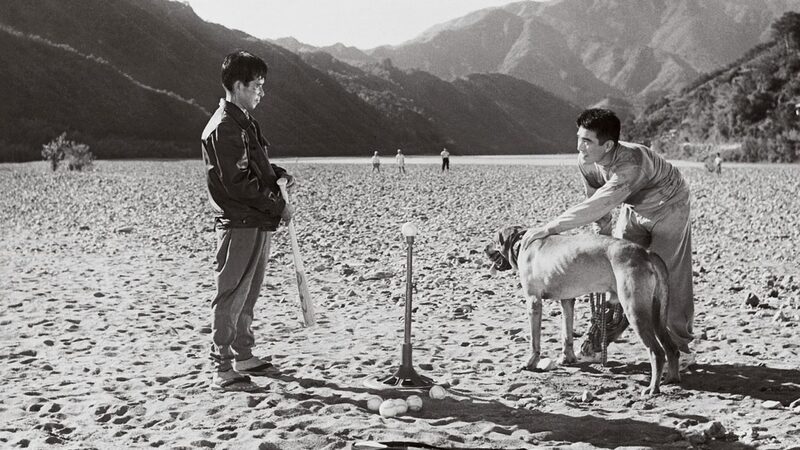 We follow a scout (played by the great Keiji Sada, an actor who died tragically young) who narrates as he desperately tries to recruit a sensational new hitter (Minoru Oki) onto his team. Although the competition is cutthroat, Sada seems to reach an uneasy alliance with Oki’s longtime manager (Yunosuke Ito). Ito is a sly fox, not above manipulating people’s emotions. He has a genuine, worsening problem with his gall bladder but is not above feigning attacks when he believes Oki may be lessening his resolve due to family pressures or ultimatums from his sincere girlfriend (Keiko Kishi) who wants him to leave pro sports altogether. As the bidding war deadline approaches, Oki’s rural family is fractured, parents against sons, brother against brother, his romantic relationship shattered by his own selfish instigation, and Ito, his manager, dies on the eve before the signing from an acute gall bladder attack. Even the cynical Sada feels sobered by the shark-like atmosphere when too much cash enters the picture, and he is touched by the girlfriend’s disillusion at a dog-eat-dog world seemingly without redemption. His greedy part in the ongoing systemic degradation suddenly becomes crystal clear to him. A similar noir-like atmosphere and unflinching gaze permeates Kobayashi’s Black River (1957), a saga of poor tenants in a shantytown bordering a U.S. base. Corruption from out-of-control land speculation, the black market and prostitution plague the area. A student (Fumio Watanabe), who rents a room in a ramshackle rooming house nearby, has his dreams shattered when an innocent young woman (Ineko Arima) he has a crush on is kidnapped and forced to become the mistress of a cruel, young yakuza played by Tatsuya Nakadai. The tension builds throughout the story as Nakadai not only abuses Arima but colludes with the rooming house’s landlady to forcibly evict the tenants to make way for a love hotel. By the end Watanabe and Arima have had enough and Arima tragically takes matters into her own hands. Kobayashi spent the next four years in a creative fever, creating one of the most monumental anti-war epics ever produced anywhere in the world. Based on a popular six volume novel, The Human Condition (composed of three movies, each three hours long (! ): No Greater Love, The Road to Eternity and A Soldier’s Prayer) saw release between 1959 – 1961. 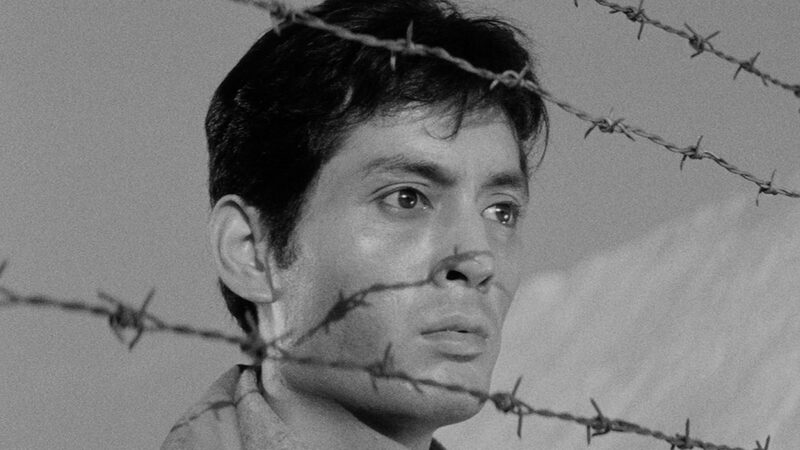 In the first, Tatsuya Nakadai stars as a young pacifist drafted at the beginning of the Pacific War but assigned to civilian administrative duties at a slave labor mining camp in Japanese-occupied Manchuria. He lives with his supportive wife (Michiyo Aratama) but is gradually vilified, then punished by the military police for trying to alleviate the appalling conditions suffered by the workers. As a penalty, in part two, he is separated from spouse Aratama and sent into active duty on the worst front of the war with the Chinese. Because of his leadership qualities, he is promoted but is almost immediately in hot water for trying to subdue the sadistic discipline of the officers towards the foot soldiers and men of lower rank. Near the end, he is one of the only survivors in a spectacularly graphic battle with the enemy. At the beginning of part three, director Kobayashi follows Nakadai on his long journey home after Japan’s surrender. However, he is captured by Soviet troops and sent to a forced labor camp. Eventually, he escapes but dies in the snow, dreaming of his loving wife. If you have not seen this nine-hour marathon (that goes by quickly, it is so mesmerizing), it cannot be recommended highly enough. 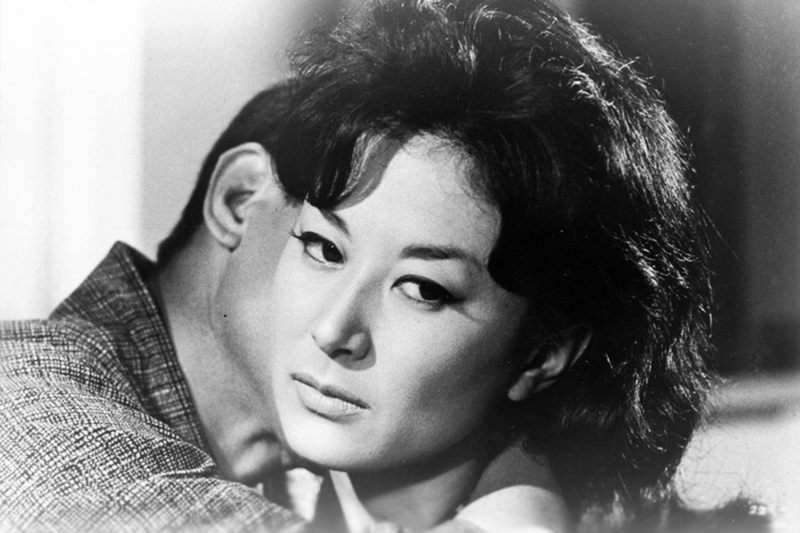 Before embarking on his trio of most well-known films (Harakiri, Kwaidan and Samurai Rebellion), Kobayashi was to make one more powerful noirish melodrama The Inheritance in 1962. Once again the director adapted a popular novel to reflect his own perceptions of the greed that leeches common decency out of human beings when presented with easy access to extreme wealth. A powerful, dying business tycoon (So Yamamura) decides to leave at least two thirds of his fortune to his three illegitimate children – but first they must be found. A labyrinthine series of subplots unfurl as his avaricious wife, shark lawyer (Seiji Miyaguchi) and lawyer’s assistant (Tatsuya Nakadai) scheme and counter-scheme secretly against each other to sabotage the search for the true heirs and worm their own way into snagging the old man’s riches. The tycoon’s seemingly humble secretary (Keiko Kishi) narrates, and she does, indeed, relate her disgust at the internecine warfare going on behind the millionaire’s back. She also becomes embittered when the tycoon, unable to leave his house, feels entitled to recruit her as his new mistress despite her protests. When the various plots disintegrate under the weight of the larceny, forgeries and murder that have followed in their wake, secretary Kishi informs tycoon Yamamura she is pregnant with his child, and thus inherits his entire fortune. Kishi later reveals to us in her voice-over that she had a secret lover (who is most likely the father), and one gets the impression that, though she was the most decent person around the dying magnate, she felt tainted by the greed and thus entitled to use the avaricious cutthroats for her own ends. The Inheritance is startling, grimly amusing and fascinating, despite it being a dialogue-heavy melodrama. Between 1962 – 1967 Kobayashi turned out a triptych of his most famous movies. Harakiri was the first. Much like his friend and colleague Akira Kurosawa, Kobayashi had discovered it was easier to critique contemporary power structures and the resulting myths of upward mobility for many ordinary citizens by setting stories in Japan’s feudal past, using the popular jidai-geki (or historical story) in-period genre as a way of transposing patterns of exploitative human behavior so they would not be as obvious to censorious studio heads or politicians. 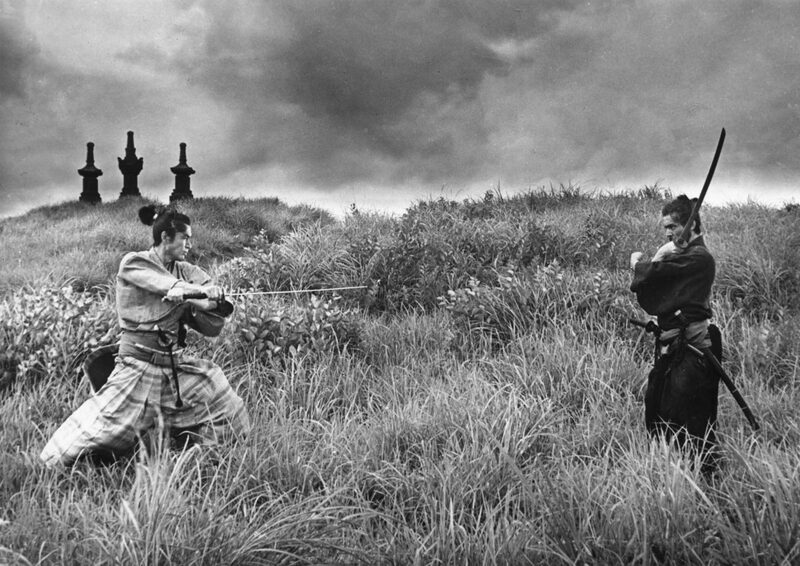 Jidai-geki, referred to most commonly outside Japan as the samurai film, was a tool to not only tell riveting tales, but to express the struggle of the individual to retain their humanity in an ever escalating process of dehumanization. Harakiri tells of an impoverished middle-aged samurai (Tatsuya Nakadai) who requests to commit seppuku (known more commonly as hara-kiri outside of Japan) on the grounds of a local clan’s castle. This practice had grown in swelling numbers since the abolishment of many clans after the rise of the all-powerful Tokugawa Shogunate. Many masterless samurai had been forced into regular society with no alternatives, as common jobs were held as beneath a swordsman’s honor. Thus the only way out was ritual suicide. But desperate samurai with families to support had also created an epidemic of false requests to commit hara-kiri on different clans’ castle grounds in the hope the more humane daimyo (or province lords) would either grant them employment or, at the very least, donate money to help with their hardships. A backlash had occurred at the castle Nakadai visits, with the three resentful top samurai (Tetsuro Tanba, Yoshiro Aoki and Ichiro Nakatani) coldly forcing any such requests to be followed through. It turns out Nakadai’s own son-in-law (Akira Ishihama), frantic to raise money for his terminally ill wife (Shima Iwashita) and child, was the first victim of this new policy. Through the deceptively stoic discussion with the clan chamberlain (Rentaro Mikuni), Nakadai slowly reveals his true identity and reason for requesting to commit hara-kiri. From there, Nakadai’s recitation of events outside the castle, including the embarrassing fate of the three samurai who had overseen his son-in-law’s death, finally erupt in a pitched sword battle with Nakadai challenging the castle’s entire contingent of swordsmen. 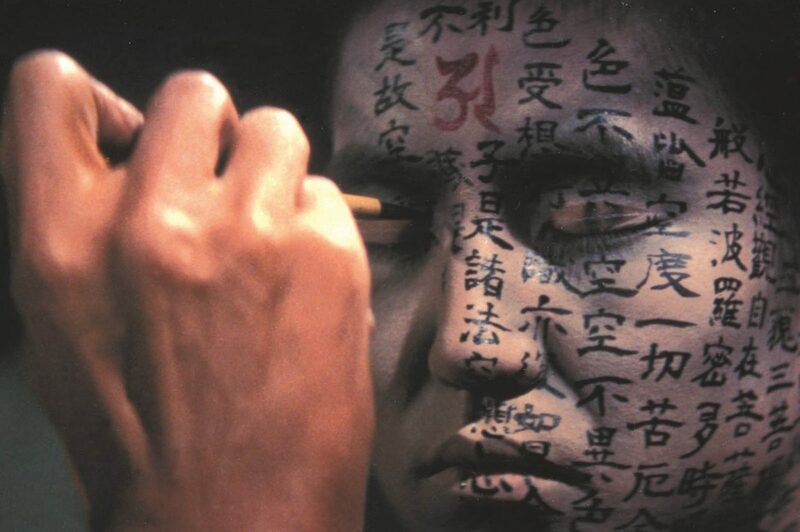 Kwaidan was a long ordeal for all involved and, despite the avalanche of critical praise, did not do particularly well at the Japanese box office – a bit of a mystery considering the popularity of in-period ghost story movies in the 1950s-1960s. 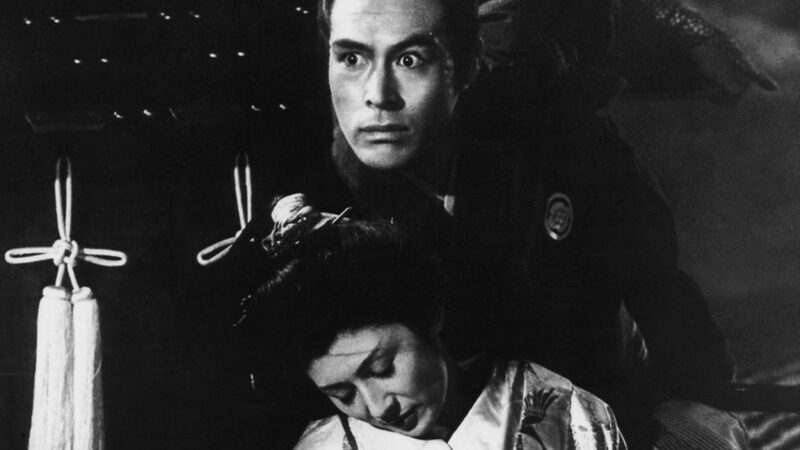 It took until 1967 for Kobayashi to get the humanist, subversive jidai-geki, Samurai Rebellion, off the drawing boards, aided in part by star Toshiro Mifune’s own production company. The film continues many of the same critiques raised by Harakiri of Japan’s past feudal ruling system, and how those feudal mindsets are still reverberating in contemporary Japanese society. Toshiro Mifune is the moderately wealthy vassal of a local lord. When the lord instructs Mifune’s son (Go Kato) to marry his pregnant concubine (Yoko Tsukasa), who he is replacing because of her anger at his bestial, libertine behavior, Mifune’s family reluctantly agrees. However, two years later, the now happily married couple are ordered to split up and the woman returned. The lord’s heir with his latest concubine has died of a cold and the son his former concubine (Tsukasa) birthed is now his new royal heir. 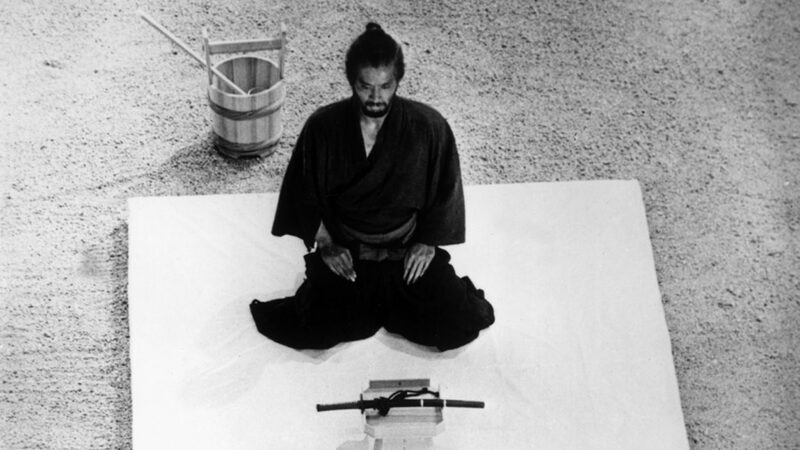 Mifune, as well as his son and son’s spouse, refuse (the young couple now have a beloved daughter of their own), despite protests from relatives, including Mifune’s cold-hearted wife and cowardly younger son, and the film culminates in a battle between the lord’s swordsmen and Mifune. 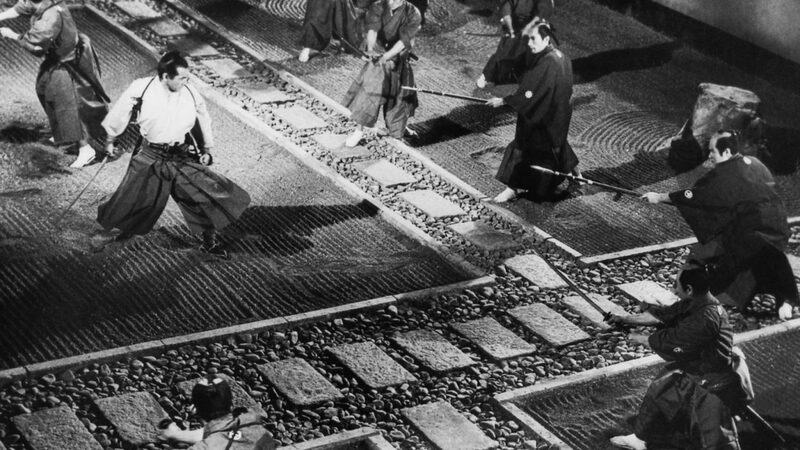 Because of Mifune’s sword skill, he manages to slaughter all of his attackers, leaving only his best friend (Tatsuya Nakadai) to fight – but Nakadai is his equal in swordsmanship. In 1971, Kobayashi helmed yet another period film, Inn of Evil, with an all-star cast, including Tatsuya Nakadai and Shintaro “Zatoichi” Katsu. 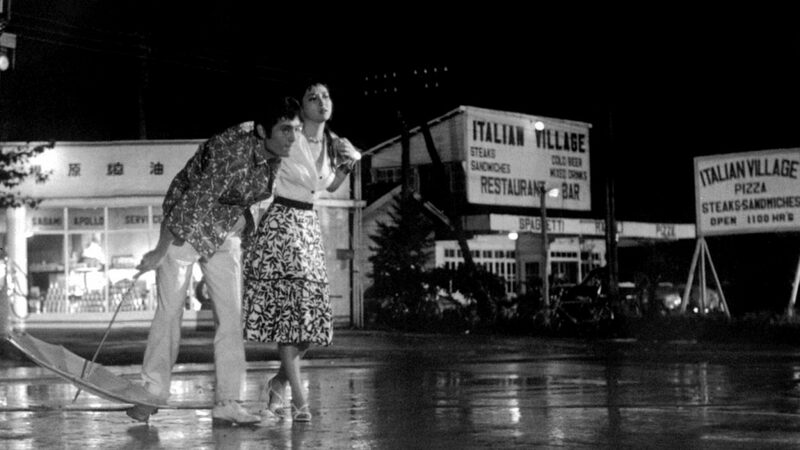 Although a good film, revisiting many of Kobayashi’s social concerns, the story of a notorious inn that is home to a roving coterie of cutthroats, thieves, con men and itinerant swordsmen banding together to help a young couple in jeopardy from the authorities, is a bit of a letdown. The B&W cinematography is beautiful, the acting quite good, but the script seems somewhat contrived and the production schedule more hurried than usual (considering Kobayashi’s customary long shoots). One guesses that he compromised some of his common stipulations to make the film so he could raise funds for his own languishing, more cherished pet projects.